Iridescent paints are also known as "metallic" paints that do not tarnish. They mimic the effect of bronzing powders. Many bronzing powders cannot be used with acrylic emulsions as they tarnish due to the alkalinity of the binder. Liquitex Iridescent Colours produce a variety of non-tarnishing iridescent or metallic effects. Made from titanium coated mica flakes with an outer layer of a transparent light absorbing colourant, rather than traditional pigments. Light Absorbing colourant layers determine the observed colour. Iridescent pigments are "optically opaque" and they rely on reflected light only for their effect. No Interference "flip" colour is observed. They can be used alone or mixed with other Liquitex Colours and Mediums for a variety of iridescent, metallic effects. Transparent and translucent colours provide the best results for mixing. 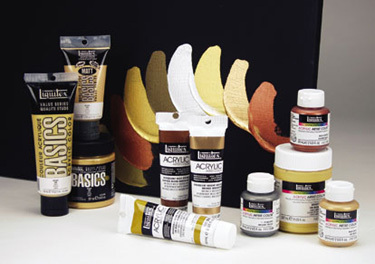 Mix with small amounts of Liquitex Acrylic Colours for variety of "metallic" colours, i.e. copper with green = antique copper. Mix with Liquitex Soft Body Mediums for "metallic" glazes. Mix with Liquitex Texture Gel Mediums for "metallic" textures. Iridescent White is added to other colour to attain pearlescent qualities.